For the first time ever, we have a picture of a black hole. Behold the supermassive space-time phenomenon that lies at the heart of galaxy M87, 55 million light-years from earth. 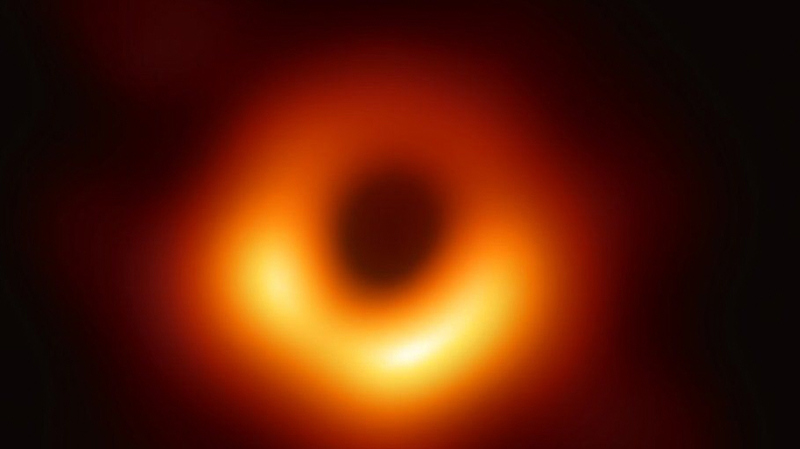 The image was captured by the Event Horizon Telescope, which is actually a network of eight ground-based observatories around the world, working in concert. The consortium announced today that they have successfully captured the first optical image of a black hole. A black hole is as much a condition as it is an object—it’s a region of space-time warped by gravitation (probably, in most cases, initiated by the collapse of extremely massive stars) to the point that not even light can escape. The idea that gravity could absorb light was first proposed by astronomer John Michell in 1784, but it wasn’t until Albert Einstein developed his general theory of relativity in 1915 that black holes were named, and described. Today, everything has changed again. Einstein was right, and so (of course) was Hawking. Black holes exist, they’re monsters (the one above is 40 billion kilometers in diameter—larger than our solar system); we know how to find them, and we can see them. What’s next? On days like this, it feels like there’s literally no limit. This entry was posted in Homepage and tagged Albert Einstein, astronomy, black holes, Event Horizon Telescope, physics, science, Stephen Hawking. Bookmark the permalink.